Aided by our fun-loving instructors, create an original masterpiece of your pet, all while enjoying food and drinks! 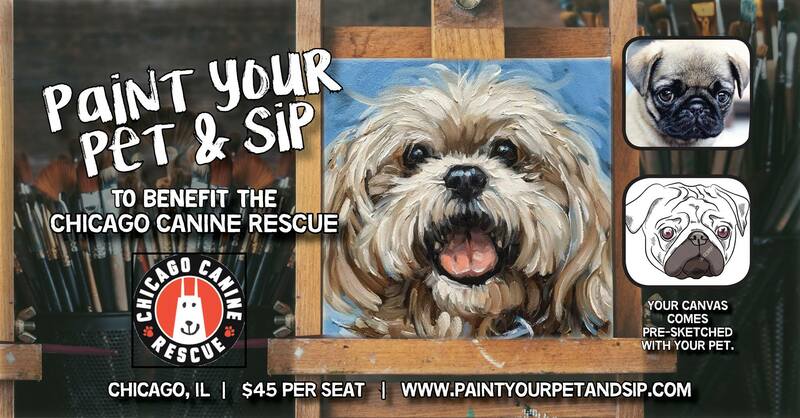 For this class, we are donating a portion of every ticket to Chicago Canine Rescue. Whether you have a cat, dog, bird, or lizard- come join us as we paint masterpieces of our pets while supporting a great cause. One pet per canvas. All skill levels are welcome! CCR was founded in 2001 to help find permanent, loving homes for homeless dogs in our city. In just over fourteen years, CCR has saved the lives of over 6,000 dogs, cats, kittens (yes, we have started helping a few felines each year, too!) and puppies. -No outside drinks. Minimum one drink purchase per guest. You can bring snacks or food with you.